Use brand architecture for a solid foundation - ThoughtForm, Inc.
A good brand consists of layers of words, messages, images, and impressions that work together to create a company identity. This is well known. But how you build these layers is open for discussion. Do you start on the outside and design the first impression your customer sees? Or do you build your brand from the inside out by first assessing your infrastructure, including products and services, audiences, resources, and budgets? After all, these internal factors greatly influence the formation of your brand. The answer is to do both. These two approaches are not mutually exclusive. In fact, they inform each other. At ThoughtForm, we often explore the two approaches when we run a discovery session to help a client build their brand. We might spend the first half of the meeting understanding the internal mechanism of the company, from offerings to values to environment. In the second half, we define the new brand in terms of personality, messaging, and visuals to help create that first impression. So where should you really start when defining the brand that’s right for you? Start by ensuring the brand has “good bones.” Think of a brand like you think of a house. When you build a house, you need to have a plan and create a strong foundation. It’s the same thing when building a brand. But there’s a lot of flexibility with architecture. Sometimes you have an older home (or brand!) with good bones, lots of character, and plenty of rooms to start with. Or, sometimes it’s new construction with a simple open floor plan. New construction can have good bones too. The key to a successful home (and brand!) is having a solid foundation to begin with. An essential step in building a brand with a good foundation is selecting the right model of brand architecture. It will act as your plan, or blueprint, for your brand “house.” Brand architectures include a template of standard elements and optional features that help you imagine how your brand will work when it is built. This may sound a little daumnting, but the good news is that you don’t have to start from scratch. There are well-known brand architecture models that can give you a strong starting point. Depending on your company’s market positioning and business path, you can easily align with one of these existing models.From there, you’ll adjust parts of the model to build your own unique brand. There are five models that we’ve found in some of the world’s most successful brands. Monolithic, Monolithic Plus, Endorsed, Endorsed Light, and Pluralistic. Monolithic and Monolithic Plus speak to companies with a strong, clearly established parent brand. Endorsed and Endorsed Light address companies where there is an intrinsic relationship between the parent and “child” brands, or sub-brands. And a Pluralistic brand is that house with many rooms—a collection of strong sub-brands with unique audiences and markets. Monolithic. Pluralistic. These may seem like daunting terms. 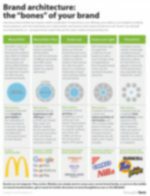 But these brand architecture models are not just applied to large Fortune 500 companies. They are completely scalable concepts that can be applied to any type of company or organization in any industry—large or small. They are also changeable. As the market changes, you can migrate to another model that best suits the climate. Your offerings, budget, and resources can be influencing factors when selecting a brand architecture model. But with so many brand structures to choose from, how do you decide which is right for your goals? Download “Brand Architecture” to find out.